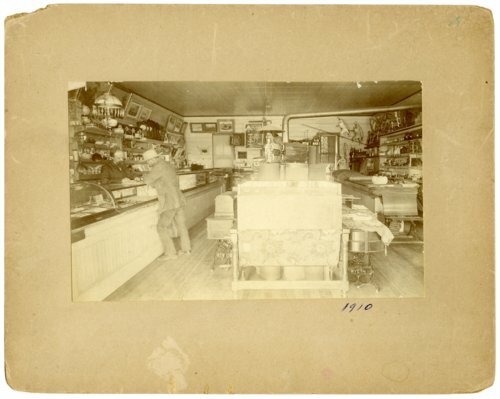 An interior view of Johnson Jewelry in Alta Vista, Kansas. Writing on the back of the photograph reads, "Chris Johnson Jewelry store located south of Buchman's Farm Supply. Started in 1888, Chris was a cabinet maker and carpenter and later took up jewelry trade. Continued in jewelry until his death in October 1914. He was born in Dockenhuden, Germany December 27, 1854. Came to the United States in 1876. He married Emilie Wolgast June 28, 1889. Six children raised five."